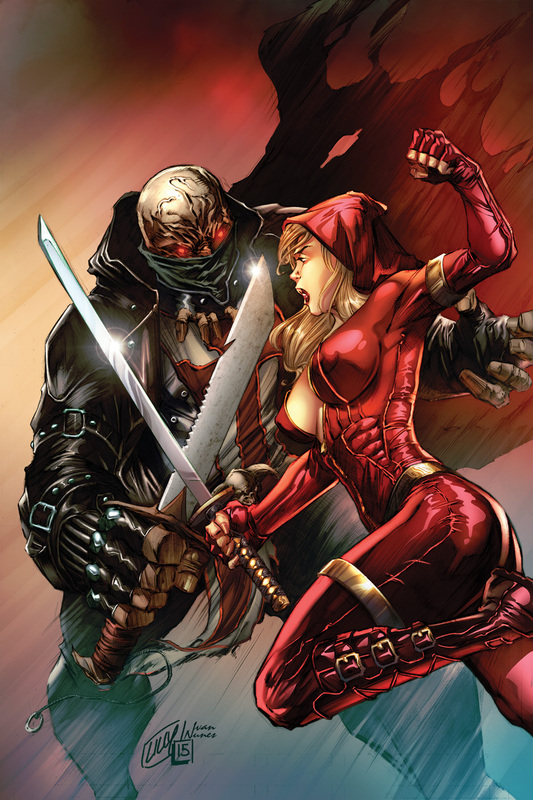 Pullbox Reviews: Red Agent #1- They took her basket of goodies… Big mistake. Britney Waters, aka Red Riding Hood, is recruited by a secret government agency to help take down an extremely dangerous terrorist organization called The Circle. Using the codename “Red Agent”, Britney must locate a hacker named Ditto who may be the only chance the government has at stopping the terrorist group. But The Circle has sent its sadistic laboratory-enhanced soldier Alpha after Ditto, making Britney’s mission much more dangerous than anticipated. Shadowy government organizations. Globe spanning terrorist groups. Mutants and monsters wandering around. Reluctant heroes. Does any of that sound interesting at all? It might, and if so, you might want to take a look at Zenescope’s Red Agent. I’m not saying that Red Agent is perfect. It’s not. The story carries more than its share of well-used tropes and plot devices, and some of the action layouts are a little tough to follow. For all of that, this could turn out to be an entertaining bit of fluff to take your mind off the everyday. We start out with a shadowy figure infiltrating a high security installation aboard a boat. He takes out a few guards and acquires his objective, a little girl named “Eve”. On the way out, he introduces himself as Alpha, the “First Knight”, and tells Eve that with her help he will soon be one of many. Alpha makes a thrilling escape, end prologue. Shift to Cheyenne Mountain, Colorado, former home of the North American Aerospace Defense Command, now serving as central command for the Highborn Initiative. Now I haven’t been following many of Zenescope’s titles, but we are given enough information to make the jump. Highborns are essentially the aforementioned “mutants and monsters”, and the Highborn Initiative is working to identify, protect, and educate the growing numbers of super powered individuals. I’m sure that there aren’t any underlying motivations behind this seeming benevolent mission statement. The Highborn Initiative wants Britney Waters, aka “Red Riding Hood” to lead the charge, a call she is reluctant to answer. Of course, this would be a very short run series if Britney didn’t eventually sign on after some talk of the greater good and protection of innocents. She agrees, with the assertion that if she signs on, she’ll do it (wait for it…) her way. My biggest criticism would be more in the page layouts. In particular, there’s a sequence that could have been better served with larger panels… not necessarily a “splash” page, but definitely bigger than what’s presented. The action was rendered so small that it was difficult to see what was happening. I found myself having to refer to previous panels to piece together what happened from one panel to the next, and the impact of the action was completely lost. Also, the end sequence was a little anti-climactic, but keep in mind that this is a first issue in a run slated for five issues. Hopefully that gives time for a few tweaks, because if Red Agent can get her legs under her and build up some steam, she could be a fun addition the genre of re-imagined fairy tale adventure. Backed into a corner by a Big Bad Wolf, I’d give Red Agent a very optimistic and hopeful 3 out of 5 stars. There’s room to grow here, and I like the concept of the bent and twisted fairy tale, so I’d like to see Red Agent do well.